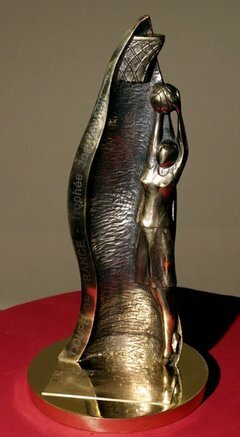 The prize for winning the basketball Coupe de France 2009 is a place in the EuroLeague Women 2010 competition as well as the Joë Jaunay trophy. For the two clubs remaining from NF1 even with home court advantage the task of qualifying for the semi-final was difficult. The clubs in the LFB beat both sides. Union Hainaut Basket fell at home to Villeneuve d’Ascq (59-80). Once again Géraldine Robert (right) was the spark behind the victory. She scored 20 points and picked up 11 rebounds. She also had 2 assists, 3 steals, 1 block and drew 10 fouls with just 2 turnovers. Florence Lepron had a perfect shooting day for her 12 points and 6 assists. Three-point Jolene Anderson was on form with 4-of-7 from her favourite distance from beyond the arc as she scored 16 points. Villeneuve took control of the game early in the first period and led (20-10) by the end of the first period. The second quarter was evenly contested with Villeneuve going into the break ahead (38-26). UHB were unable to get going in the second half. With Kathy Wambe hurting her ankle and without Clémence Beikes they looked lost and allowed Villeneuve to cruise to victory. Villeneuve will meet Bourges Basket in the semi-final. Charleville-Mézières played without Dana Boonen. They were dependent on the LFB experience of Floriane Herrscher and Carine Contessi who scored 16 points each in their game against Bourges Basket. Bourges Basket did not waste much time and led (8-0) after three minutes but then found things difficult as Charleville-Mézières fought back. To Pierre Vincent’s disappointment Bourges led only (14-11) at the end of the first period. Bourges went back to basics at the start of the second quarter to open up the first significant lead of the game (27-14) after 17 minutes of play. Amel Bouderra who also has played in the LFB and Contessi fired in shots from beyond the arc as they stopped Bourges from increasing their advantage at the interval (24-35). After the break Bourges Basket applied their suffocating defense and went into the final period with a comfortable advantage (63-41). Bourges were not troubled for the rest of the game and won (81-61). Emméline N'Dongue (left) led the scoring for Bourges with 15 points. Nice held Aix-en-Provence for the first five minutes (8-7). Once Hollie Grima (right) went to work Aix led (32-16) by the end of the first period. Aix were never in trouble after this and won (91-63) with Grima leading the way with 28 points. Yacine Séné followed with 16 points, the same total as K. B. Sharp. For Nice Johanne Gomis scored 22 points and Alina Slabecka scored 14 points. Aix-en-Provence will meet Tarbes in the other semi-final to be played in Rennes on Sunday, 19th April 2009. 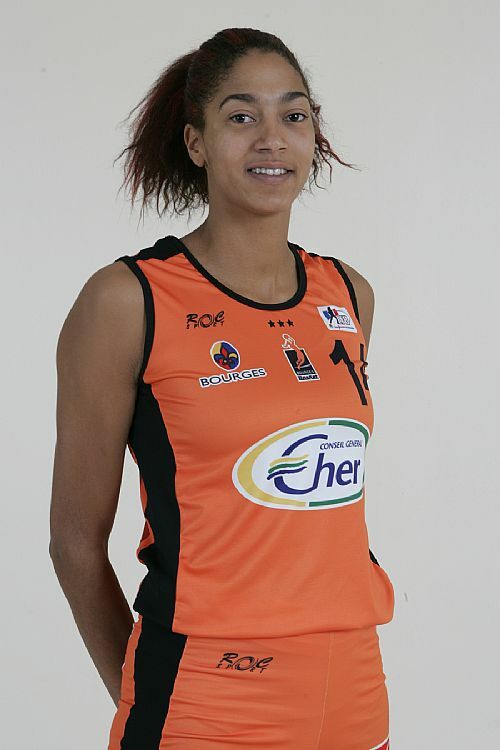 Isabelle Yacoubou-Dehoui was back in action this weekend for Tarbes. She made her presence felt from the tip-off with the first points of the match. Yet for the first four minutes of the game, both teams gave a perfect display of shooting with nobody missing with Tarbes holding the advantage (8-7). Tarbes then made home advantage count as they went on a 16-3 run. But they relaxed allowing their guests to score the last 6 points of the first period. Leading (24-16) at the start of the second quarter Tarbes' lead grew as Liene Jansone scored back to back baskets in an 8-0 run. The two sides then traded baskets for the rest of the quarter with the hosts staying in front (41-28) with Yacoubou and Jansone scoring 18 and 10 points each. The second half of the game was completely different. 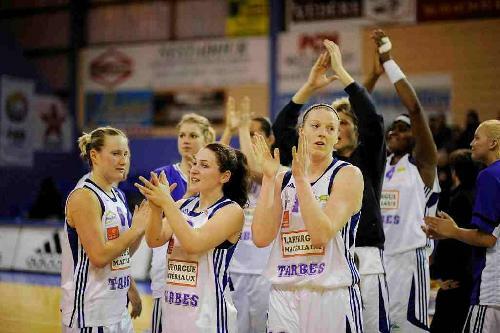 Yacoubou and Jansone disappeared offensively for Tarbes but Liz Moeggenberg came to the rescue. However Montpellier started to play the better basketball. Once Sheana Mosch started to find her way to the basket the pendulum started to change. With Elodie Bertal, Khadijah Whittington and Pauline Krawczyk starting to win their duels the guests reduced the deficit to 8 points by the end of the third period (45-53). Bertal opened the final period with a trey for Montpellier as her side continued their onslaught. Tarbes managed to hold on to their lead with Tanisha Wright (right) dishing out assist after assist (60-50). The last five minutes were end to end basketball with the hosts ahead (67-58). Then the game entered the last two minutes after Wright scored two free-throws. Whittington continued to cause problems in the paint for Tarbes and scored back to back baskets for Montpellier. Gaëlle Skrela hustled Jansone into losing the ball. She then set up the next attack which she finished off to make it a three-point game. Montpellier continued to dominate in the play. Mosch was fouled by Wright while shooting. She made no mistake from the free-throw line. Jansone was caught napping once again, this time by Krawczyk. In turn she delivered a pass to Bertal who scored. With just over two seconds remaining in the game Montpellier regained the lead (68-67). François Gomez, the head coach of Tarbes, called a time-out to set up the last play for Tarbes. The final play had WNBA written all over it as Wright hit the buzzer beater for Tarbes. Yacoubou-Dehoi was the top scorer with 20 points. But the player of the match was Wright with a triple double of 13 points, 13 assists and 10 rebounds.